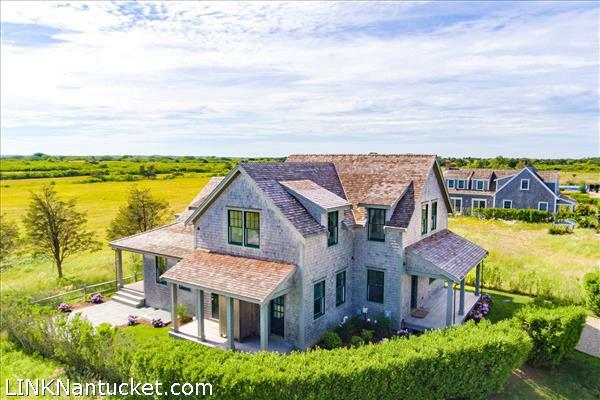 Well crafted new construction in Sconset. Thoughtful design and execution. Formal entry leads to a first floor master, large utility/mud room and study with separate entrance and adjacent full bath. The main hallway opens to vaulted sunny open concept living space with fireplace, large dining area and gourmet kitchen. The second level has a second master suite and bedroom with attached bath. From the upper landing the hallway transitions to a bridge the spans the first floor living area and leads to an outdoor deck with views of conservation land. The basement is fully finished and very large with an additional bedroom, full bath, and a gym differentiated from the open space with a floor to ceiling glass wall. There is generous outdoor space with porches and a stone patio. Please send me more available listings similar to 2 Hydrangea Lane, Sconset. Thank you!